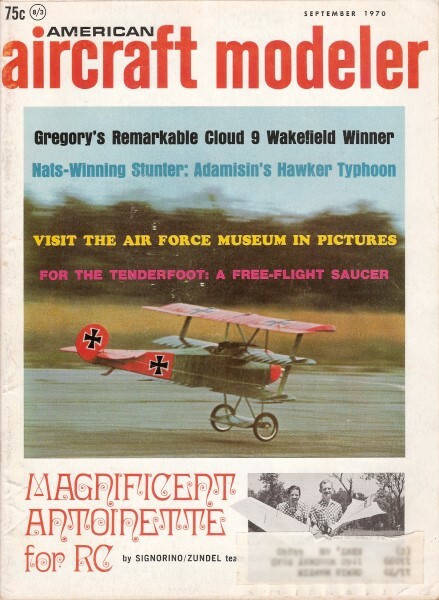 Here is an interesting little 1/4A free-flight model. 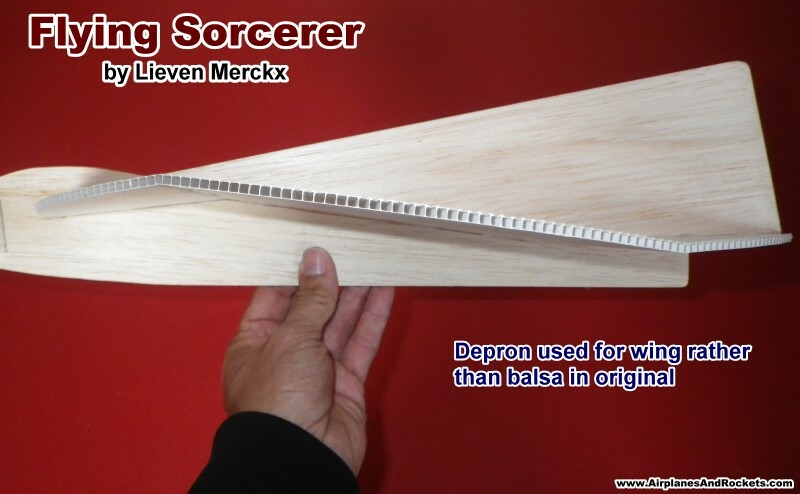 The round wing planform is unique enough, but what I really like is the s-curved airfoil formed into the balsa sheet wing. Designing and test flying these kinds of models with unusual construction techniques often takes a lot of time and effort by the designer. It is really good old seat-of-the-pants aircraft development. 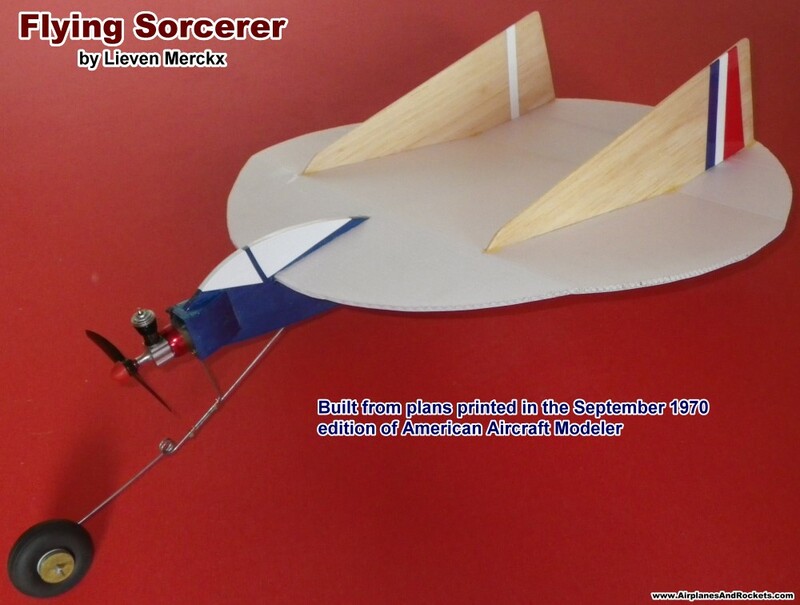 Whether it be flying Snoopy dog houses, witches on broomsticks, or flying saucers, there is always someone out there willing to put the work into making those kinds of models fly. 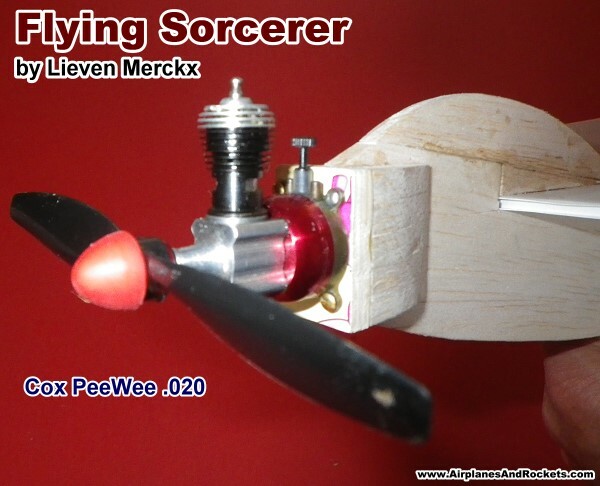 Website visitor Lieven Merckx, of France, was kind enough to send me these photos of the 'Flying Sorcerer' that recently he built. 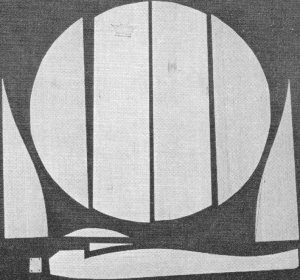 Depron corrugated plastic was substituted for the original balsa wing. The heavier weight of Depron necessitated more counterweight ahead of the center of gravity, so Lieven made good practical use of it by adding a wheel. At the bottom of the page are a couple close-up photos and a video of the first flights. Notice how each flight improved as Lieven made trim adjustments. Free flight is the one realm of model aviation that requires a good working knowledge of aerodynamic in order to achieve a good combination of powered and unpowered flight. 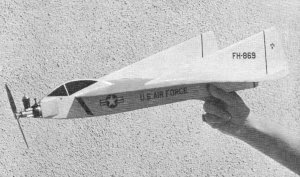 He noted that these flights were made 45 years after the article's appearance in the September 1970 edition of American Aircraft Modeler. Do you believe in flying saucers? Now you can -this one's for real, an 020 free flight. 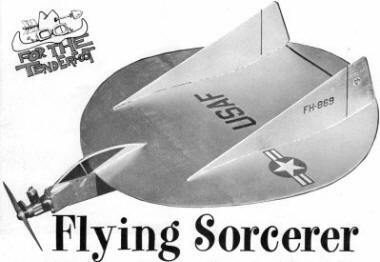 AFTER some years of study, the Air Force apparently has decided that flying saucers really don't exist. Perhaps they should have paid more attention to Southern California before making up their minds, because flying saucers have been seen there for quite a while. Of course, these saucers are not too big and don't fly too long, so possibly the Air Force can be excused. These UFO's are in reality models, the latest version being the Flying Sorcerer. Earlier models were powered by various-sized engines, including one Jetex-powered version. Then there was the model known as the Flying Pizza because of an unfortu­nate color scheme composed mainly of yellow and red! Before beginning construction, it is especially important to study how the various pieces are cut from sheet wood. The following materials are needed: 2 pieces of 3/32 x 4 x 36" balsa; 1 piece 1/4 x 2 x 18" balsa; 1 piece 1/8 x 1 x 1" plywood; 1 piece 1 x 2" gauze; and 4, No.2 x 3/8" wood screws. Take the two sheets of 3/32" balsa and select the harder. This is the sheet to use for the front and back pieces of the wing and for the fins. To get the shapes correct, put the wood under the plans and , with a pin, prick through the outline of the shape onto the wood. Next, using a ballpoint pen, join the marks. Mark all the pieces before beginning to cut the balsa. 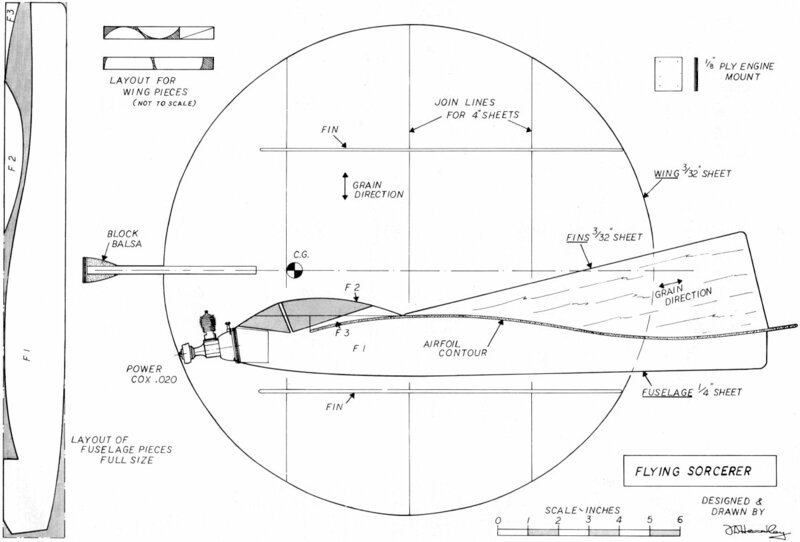 When assembling the few parts involved, fuselage and rudders hold wing's curved airfoil. Use lots of glue and pins at these joints. Simple markings made with paint, decals, and marking pens turn it into a USAF-type plane. Model must be painted for fuel protection. When everything is laid out and all the various pieces have been fitted onto the sheet stock, cut out the pieces with a single-edged razor blade. Check these pieces with those shown in the photo to make sure all the required ones have been cut. Pin down the plans on a flat board, cover with wax paper, and cement together the four balsa pieces to make the circular wing. While this is drying, the engine mounting can be fixed to the fuselage. Cement the small blocks of balsa to the nose of the body (these blocks can be built up from scrap pieces of 1/4" sheet if no block balsa is handy). When the blocks are dry, sand the nose pieces flat and cement on the 1/8" ply engine mount. It is best to leave this to dry overnight. When both assemblies are thoroughly dry, the wing can be cemented to the body. 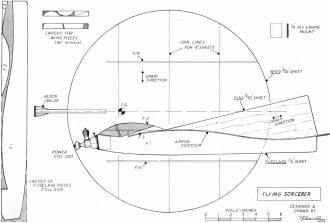 It's a good idea to draw, with a ballpoint pen, the three lines on the top of the wing. They indicate where the wing is placed on the body and where the fins are located. The fins can be attached now, making certain they are lined up straight before the cement dries. Next, add the remaining pieces of 1/4" sheet for the canopy. Suddenly, it's almost finished! Let everything dry before going over all the edges with sandpaper. The final task is to cement a strip of ordinary gauze bandage to the firewall and around the nose block. This reinforces the engine mount. Use wood screws to mount the engine. Give the completed model one coat of clear dope and, after this dries, sand lightly and put on one more coat of clear. Sand again, then put on the color dope. Do this very lightly; too much weight will reduce the model's performance. The prototype was sprayed silver and a few decals added to dress it up. The markings also can be applied with colored felt pens. Check the balance when the model is completed. If it does not balance at the point shown on the plans, add a little modeling clay at either the front or back until it does. Then try a few hand launches into some long grass. A nice smooth glide is required. If it dives too fast, bend the back of the wing up a little. If it stalls, bend the back of the wing down. When it seems about right, at­tempt a power flight with the engine at low power and the propeller on backwards. If the model climbs to the right, everything is fine; if it flies straight or to the left, put a small washer under each engine mounting screw on the left side. This will make the engine point a little to the right and should make the model climb properly. Glide can be trimmed finally by small adjustments to the back of the wing. After a few flights at low power, try putting the propeller on the correct way and opening up the engine a little more. The model's performance is excellent, so don't forget to attach your name and address. They may be needed! Video of initial trim flights - this takes real skill. Look at that amazing flying field!